I grew up with May Day being an International Workers Day. Even though it was a holiday, it was an official holiday and people were required to participate in parades officially held in all major cities and translated by all TV stations. In my city, I remember, all traffic would be blocked for those demonstrations in the downtown area from early morning and until 2-3 p.m. My room’s window was facing one of the major streets and I would be woken up by music, megaphone announcements and other human noises. And then, for hours, non-stopping streams of people with flags, banners, balloons and artificial flowers would flow by my window toward the main city square. As a child I liked that holiday: it was a real beginning of the spring, we would get two days off school, kids weren’t a part of those demonstrations (unless their parents took them to their groups formed by places of work) but it was festive, different from regular weekends and there always was something interesting to do during or after the main event (like shooting balloons with a slingshot, for example). I haven’t been not only celebrating but even acknowledging this holiday for many-many years and this year with everything going on under the sign of this day I’d be even less inclined to feel any nostalgia towards May Day if it weren’t for my hobby. Starting last year, when I read about it for the first time, I chose to associate this day with a beautiful French tradition of giving bouquets of lily of the valley. I’m fascinated by this flower. I’ve always been. It looks fragile and lusty at the same time as if those tiny flowers were carved out of a very white ivory and carefully placed against a backdrop of flat wide leaves. And I love a very distinct lily of the valley aroma unmistakable with any other. For a while I was collecting samples of perfumes built around this beautiful flower and testing them for this post in my Single Note Exploration series. Then I was struggling with a horde of lemmings born after I read an announcement about this year’s limited edition bottle of Muguet by Guerlein. How cool would it have been to make a picture of that gorgeous bottle for the post about lily of the valley note in perfumery?! It wasn’t easy but I won with the moral support from Victoria (Bois de Jasmine) and Natalie (Another Perfume Blog) despite Tara’s subversive actions! 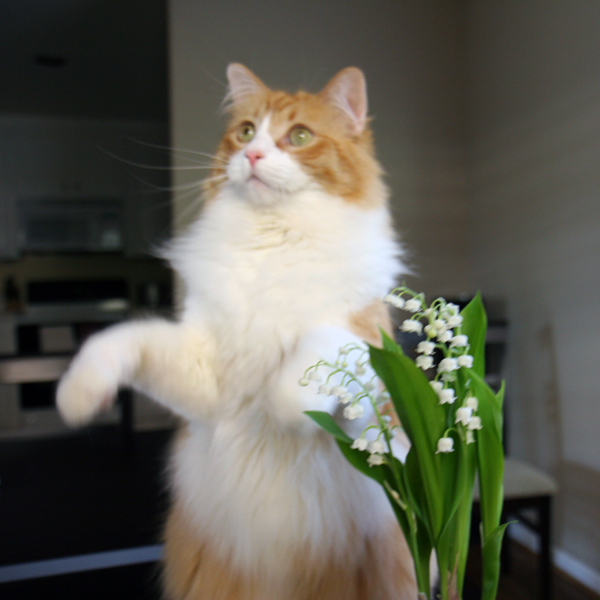 Instead I bought the last in the store pot with lily of the valley and took pictures of my very photogenic cat Rusty playing with it. That was a hell of a preamble. But don’t worry: since I’m not doing real reviews I’ll try to be laconic. I’ll skip usual “created by” and notes lists since most of these are well-known perfumes. All perfumes I tested can be divided into three categories: Lily of the Valley I didn’t Like, Lily of the Valley I couldn’t Smell and Lily of the Valley I Loved. Muguet Blanc by Van Cleef & Arpels – I smell an apple in it even though it’s not mention in notes. An artificial apple. It’s wrong. On paper I remember it being more lily-of-the-valley-y but on my skin it smells rather unpleasant in the first 45 minutes even though I think I recognize the scent of the flower. For my nose Muguet Blanc smells of a cheap synthetic lily of the valley air freshener brought in the room full of not just wilting but decaying in water floral bouquets. Then the freshener wins. In 2 hours it’s a perfectly nice scent on my skin. I’m not sure I’ll ever finish my sample. Le Muguet by Annick Goutal – in general, it’s nice, slightly more perfume-y than other believable lily of the valley renderings but still very recognizable. 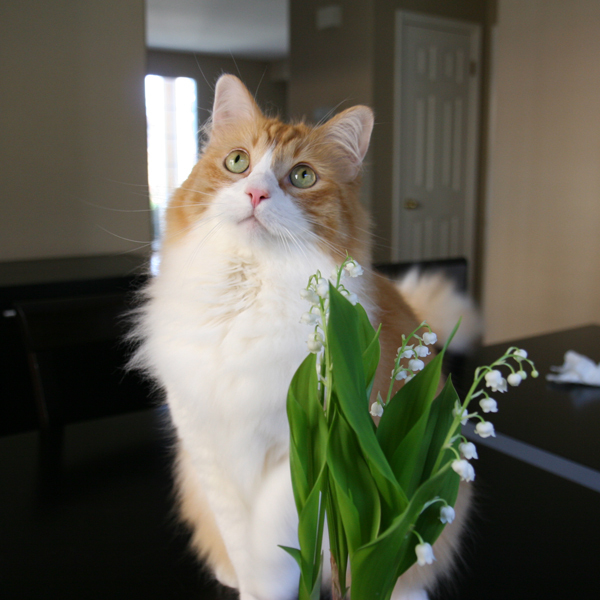 Le Muguet has some sweetness but it’s not overly sweet to my nose. Unfortunately, during one of three testing I got some plastic-y note. It might be my skin reaction but understanding that doesn’t make Le Muguet more wearable for me. I will give my sample another try but I do not see this perfume joining my collection in any form after that. You should try Le Muguet since it might behave differently on you (and if it does it smells really nice and natural). Idylle by Guerlain – for the first couple of times when I tested it (a year ago) I was sure it was a rose scent. 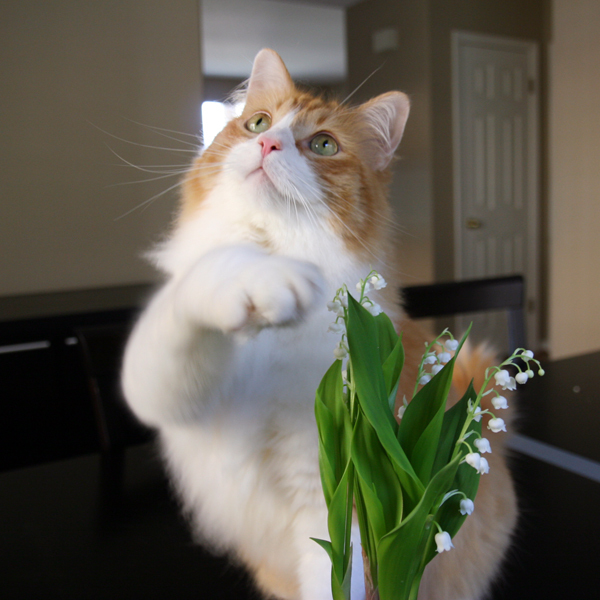 And then one day my nose picked out a prominent lily of the valley note. Since then I always think of Idylle as of a lily of the valley perfume. When tried in parallel with the other perfumes that are closer to being a soliflore Idylle feels more complex, more perfume-like and less lily-of-the-valley-centric creation than the rest perfumes I tested. I do not think Idylle is bad, it’s just not special enough for me to go beyond the sample I have (if even that). Carillon pour un ange by Tauer Perfumes – I smell pollen, a lot of sweetness and, I think, some mimosa. It has a great tenacity and I think it’s a very nice, very masterfully created perfume. But I couldn’t smell lily of the valley in it at all! I was so upset when I tried Carillon pour un ange for the first two times, I felt so cheated that I gave away my sample. It wasn’t until several months later when, after trying DSH’s Muguet de Mai Perfume and Muguet Cologne, I realized that while I couldn’t smell lily of the valley in there either it seemed to me that both Andy and Dawn smelled (tried to re-create?) the same flower. Muguet de Mai starts very lemon-y plus some earth note. Muguet Cologne starts earthy and then turns into more floral composition… Both without much lily of the valley how I know it. I got another sample of Carillon pour un ange just to confirm my impression. And I can tell that though these three are completely different perfumes I smell more in common between them than between any one of them and lily of the valley. Compared to the real flower (I think I spent hours doing that for all perfumes I tested for this post) I kind of “see” the idea but all three don’t smell as lily of the valley to me. It should be my nose, right? Samples will stay in my scents reference library. For the First of May this year I wore Diorissimo by Dior. I own a bottle of the current EdT and a vintage mini that has problems with top notes but then it’s fine. Diorissimo is so nice and spring-like! I do not love it but I like it enough to enjoy wearing from time to time. Even though Diorissimo has a prominent lily of the valley accord I do not think of it as of a soliflore. When I wear it I wear a perfume. But only when I smelled Diorissimo together with the real flower I realized how close they were. 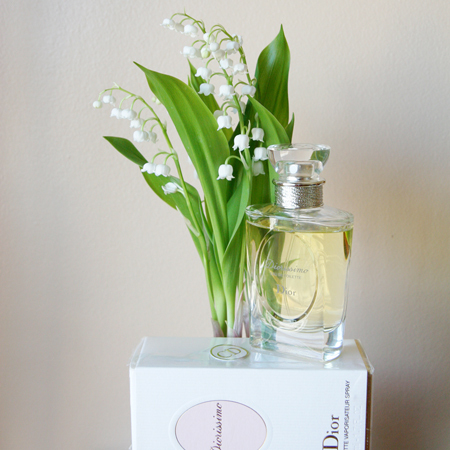 I always knew that Diorissimo was an iconic lily of the valley perfume; I wore it knowing it smelled of lily of the valley but I’ve never realized how much it smelled like lily of the valley. Wow. Muguet by Guerlain – is a fresh and very… clear scent – not in the sense “airy” but rather “without impurities” like a diamond or “not distorted” as in “clear sound”. As I’ve mentioned earlier, I fought off the urge to buy a full bottle of this perfume but I’m amazed at how much I liked it and how true it is to the real lily of the valley. I get everything – sweetness of the flowers, greenness of the leaves, general warmth of the scent. The only component that isn’t there is earthiness but I do not miss it, I’m fine with the pure floral part of the plant. I want a full bottle but will have to settle for a small decant of Muguet if I can find it. It’s so beautiful! Lily of the Valley by Penhaligon’s – I like it a lot. It’s bright, warm and very realistic. I’m not too familiar with this brand, I’ve tested just a few of their perfumes and I haven’t formed any opinion about the house yet. It was the last perfume I tested for this episode and I think I didn’t expect it to be as good as it proved to be. I suspect that I like Muguet slightly better not even because it’s Guerlain but because I loved the bottle and all that “one day only” marketing BS (sorry, Guerlain, I start liking you more and more but this February Muguet 2011 was still available at the boutique). But I’m not sure if in a blind sniffing I would be able to tell them apart. I plan to add a mini bottle of Penhaligon’s Lily of the Valley to my collection. I read a rumor some time ago that Frederic Malle had a plan to add a lily-of-the-valley-centric perfume into their line-up. If it happens I will definitely try it. Other than that I do not plan on actively seeking any more perfumes with that note being a dominant one. How about you? 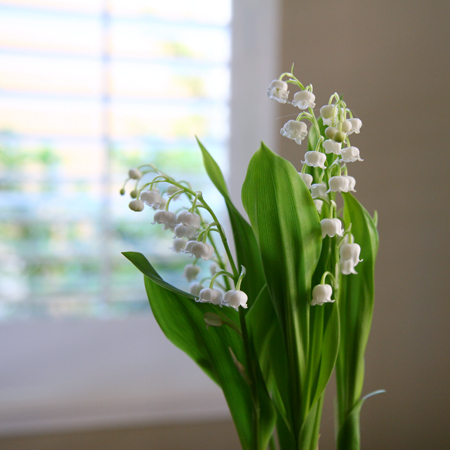 Do you like lily of the valley – as a flower or a perfume note? Do you wear it? And, what I’m mostly interested in, if you tried perfumes from my Lily of the Valley I couldn’t Smell category, did you smell lily of the valley in them?